It’s junior year of college, and all of your friends went to Europe for the summer. But, hello, you went last year by yourself because you’re so Eat, Pray, Love before it was even on Elizabeth’s radar. So, what are you gonna do in a college town in the summer when all your friends are gone? You go to bartending school… at least that’s what I did! Basically, it’s me, eleven strippers with big dreams, and one really hot musclehead instructor named Trey… I know right?! After all the Cape Cods, Greyhounds, Mai Tais, and one unfortunate ruining of a white Banana Republic polo as I was channeling Tom Cruise a la Cocktail, the ONE thing I remember is how to correctly pour a mimosa. It’s simple, y’all. The secret is juice FIRST. 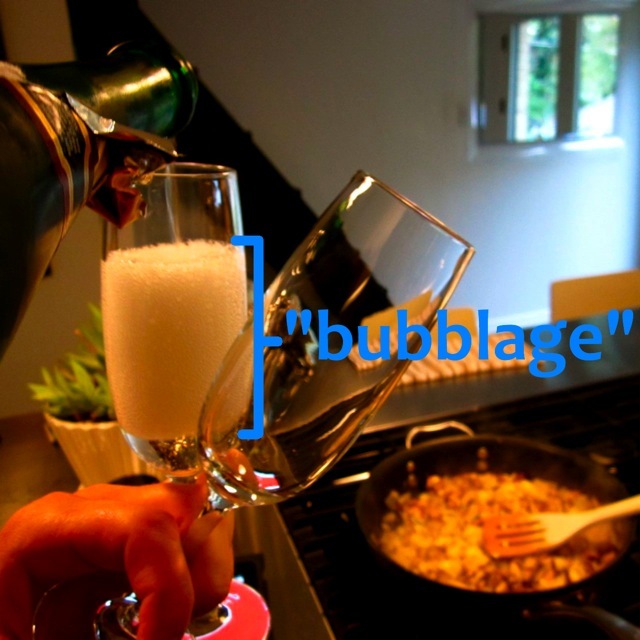 Pour a little juice in the bottom of the flute, and it will act as a buffer for the champagne so you get much less annoying “bubblage.” That way you can fill right to the top with one easy pour. Have fun impressing everyone at your next brunch with your spot-on technique. Bonus Tip: Juice is so been there, done that. Try using some orange zest or adding a couple drops of vanilla or almond extract. This one is especially helpful if you’re using cheap champagne. One Response to "chris’s corner: COCKtail"
You should pour the juice with @Roots Juices! Just saying…..